When the AUTOMATIC hub was developed the DUOMATIC hub was already on the market. This was the Wirtschaftswunder (booming economic) years in Germany. Even the sky was no limit anymore. With this background the developers and engineers from Sachs in Schweinfurt had a heroic goal. Developing a 2 speed hub with a pure mechanical AUTOMATICAL shifting mechanism and without any kind of bowden cables. They achived already a pure mechanical shifting mechanism without bowden cables with the DUOMATIC. Now the next objective was to automate the shifting mechanism. This was a tricky but the solution was found. The centrifugal force! A force which is was never used again in the history of internally geared hubs. While reaching a certain rear wheel cadence (rotation frequency) a centrifugal weight moves to a outer position and shifts from gear one into gear two. When you reduce the cadence the centrifugal weight will stay in the outer position and shifts down in the moment you´ll reduce the pedal force. Red Version (see picture above) for 20″ up to 24″ rear wheels (centrifugal weight 15 gr.). Blue Version (see picture above) for 26″ up to 28″ rear wheels (centrifugal weight 15 gr.). This is great because stretching or pushing this little spring makes it easy to optimize the shifting point for your purpose. When you use the Red version in a 26″ to 28″ wheel the shifting point will be at a higher speed (19 – 20 km/h). The Blue version will shift at a lower speed in a 20″ to 24″ wheel (10 – 14 km/h). The AUTOMATIC hub is the only hub which uses the centrifugal force to shift between the two gears. The DUOMATIC hub was already a never reached kind of autarkic mechanism with fantastic german Maschinenbau competences indside. Beside the DUOMATIC hub the AUTOMATIC represents the edge of mechanically shifting internal geared hubs. This hub is the rarest Fichtel & Sachs hub. It was produced since 1966 and only for a few years. 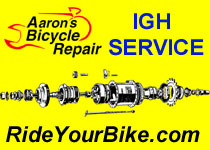 The customer prioritized the amount of gears higher than a maintenance and adjustment free hub! The majority of these hubs comes with 28 spoke holes for the Klapprad 20″ purpose. Only a minority with 36 holes. These were hubs were mainly sold in the Netherlands, Denmark and Sweden. There were some all year cyclists in these countries who rated ease of maintenance and adjustment higher than the amount of gears. Two are enough! Pictures and Explosion Drawings (German): Andree Schote is the reference concerning Fichtel & Sachs Torpedo AUTOMATIC gear hubs. The internal hub gear review show details on the performance of the AUTOMATIC hub. The AUTOMATIC hub was also used for Tandem purpose. A interesting Urban Bike concept with the Torpedo AUTOMATIC hub on Ebay. The AUTOMATIC hub has the same history like the DUOMATIC kick-back hub. The origin of the hub was the Klapprad (German folding bicycle in the booming 70th of the last century). The market required a “wireless” hub for the Klappräder. Here are the pics of the original installation and maintenance flyer (Click on the pics to enlarge!). Explosion drawing of the Fichtel & Sachs Torpedo AUTOMATIC internally geared hub. Drawing of the Fichtel & Sachs Torpedo AUTOMATIC internally geared hub. are your sachs torpede automatics new or with garantie? i need one for my 20×175 small tandem. perhaps you could repair it? the hubs are new (old stock). This means the grease inside the hubs has to be changed before using the hub. I´am a private person so there is no guarantee. To repair these old hubs you need spareparts. This is the problem! These hubs are already very rare and this is also the case for spareparts. Therefore I offer no repair service. I sold all the hubs. Sorry! Hi Marco, do you parts for hub or entire Hub SACHS Torpedo automatic? Hi, i just bought an automatic hub from ebay (cos 100 Euro is way too much money for a hub not been optimized by a mechanic). I bought the red version for 20″-24″ and build a rear wheel for my old Bridgestone 28″ Steel Frame. First i used a 48 tooth chainwheel and a 18 tooth sprocket, but i had to change it to 42 – 18 (2,33) to make it comfortable. I like it and i´m thinking about to put away the coasterbrake, the hub could loose 200 Grams of weight and it would look more straight..
for my Bike 20 inches or 24 inches. I am looking for a F&S Automatic (Blue Version) 36H, I have my 26″ bike set up with the Red version and didn’t realize that there are two models. Do you happen to have an Automatic (Blue Version) 36H for sale? Hi – I have a few Moulton bikes with Duomatic hubs and I was wondering what happens if the Automatic hub was put into a smaller wheel than 20″ (eg 17 or 16″). Would it mean that second gear engages too quickly because the wheel spins faster at a lower speed? I am intressed for a blue automatic version. I have some for me? Do you still have the 36H 26 -28 ” version for sale? If yes what would be the price? I`m interessed in a 36-Hole 28-inch version of the automatic hub. Do you still have some for sale or do you know any possibility of purchasing one? Hello, and thanks for the really informatic pages. Would you happen to have a blue automatic hub with 36 holes left for sale? Any advices where to find one, would also be appreciated. I´m intrested in a blue automatic version. Would be great if you have one for me or give me some information, where i can get one. I am filming a movie on an old rail to trail, trail from Pittsburgh to Washing D.C. Since the incline will not be too strenuous the two gears will be all that is needed. First question, if I bought ten hubs would there be a discount on the shipping? Secondly do you just have the red version, or do you have the blue version as well? I have a yellow bendix on a ’72 Schwinn Sports Tourer, and I was wondering if the red and blue versions use the kick back method to switch between gears. I read somewhere they chance gears automatically and I do not want this! And what is the spacing on the red and blue versions? if you want to change manually the gears you can use the DUOMATIC hub for your project. The spacing of the Duomatic hub is 110mm and the total axle length is 155mm. The shipment charges (10 hubs) to the US are 65,- Euro. There should be a lot of interested hubstripping customers who are interested in your movie project. Maybe you can put us in the loop via some comments here. was wondering if you have any automatic hubs for sale? the red AUTOMATIC version is still available. could you please give me a contact for uk dealer or I am happy to puchase from you .At what price? Hi! Is there any Automatic hubs left? There are no Automatics left. It should not be easy to find a dealer. Sometimes there are some Automatic hubs on ebay.de. The Duomatic hubs are still available! is it possible for me to by an ‘automatic’ from torpedo voor 36 spikes? Do you still have Duomatic hubs for sale? By chance do you have any single speed coaster hubs for sale? I am interested in buying F&S hubs. I have cleaned/lubed/laced/installed the new Automatic hub into a 451mm wheeled bike .. it works perfectly, but shifts too early for my project (18kph).. I would like to move the shift point to 24kph.. have you adjusted a hub to shift later? if so, how was it done? Did you need to make different springs? this little spring is responsible for the shifting point. By changing the spring force you can adjust the shifting point. just found this page… thanks for putting it up. purchased a Sachs two speed hub thinking it was a duomatic. it kept on shifting automatically… I thought there was something wrong with my hub. it’s identified as a blue 36 hole automatic hub. now all I need to do is change tension on shifter spring to suit my change point. Hi Duomatic lovers. I have completed a recent build using one of Marco’s NOS Red Automatic hubs and installing it in a 2009 Dahon Mu Uno folding bike .. after a few hundred miles of use, I am hooked.. a really sweet hub.. pictures and a few more comments are located at this site.. Yes!!! I’ve found a used blue Sachs Automatic!! I bought it for 116 dollars. Soon I have TWO blue Automatic hubs. I´ve order the second one yesterday. i need to fixed my moulton bike! how much you want to sell it, please advise? Hi junthong! I am sorry, but the hub/hubs are not for sale. Hi Marco! I think that you´ve done a year mistake. It says that the production of the Automtaic started in 1966 and lasted only for a few years. Jens Hansen says that the production started 1973-1980 when the Duomatic hub disaperred. What do you think about this? Hello fellow automatic lovers! I have been riding my recent Titanium framed 700c project for the past few months and love it… pure bicycling joy! Here’s a link to pictures . Does this really work well? Maybe automatic shifting is annoying in some situations, for example shifting up when pedaling hard against the wind when keeping a higher cadence would be better. Does it shift up and down over and over again when you are riding at about the shifting speed? Maybe the mechanism even slowly destroys itself by shifting under heavy load (when you try to keep speed while approaching a hill). The automatic hub (Sachs or the new SRAM) will not shift down below ‘upshift point’ while there is any pressure on the pedals.. if your shift point is say ~ 13 mph ~ and are riding at 15 mph and come to a hill, you can continue pedaling at 8 or 9 mph out of the saddle if desired.. I’ve run the Sach automatic for years and the new SRAM A2 automatic 8 to 10 miles/day all last month.. I have all my automatic bikes (3) set to roughly 14 mph to shift .. I love these hubs .. below are a few more of my experiences..
Amazing things here. I am very glad to look your post. Thanks a lot and I’m having a look ahead to contact you. Will you kindly drop me a mail? I have a 36h Duomatic, fresh & ready to ride. I’d like to trade it for a 36h Automatic blue or red. Thanks! ryanbetor(at) gmail dot com. I’ve got a 36h Automatic hub for sale. I think it’s a blue version, but the label is lost. Excellent condition from daily use. Just put my red 20h hub on craigslist. I was happy with the 23 cog’s range everywhere. for sale red band automatic in very good condition, 28H version complete with original cog. contact me if interesed. I have 24 inches folding bike. Its brand is Rixe . A very old fashion bike manufacturer in Germany. It fitted with Sachs Torpedo Automatic Hub. Automatic hub is not as we think smart or good. I say the best hub for pleasure bike is Duomatic. Uphill ,if duomatic we can use gear 1 for easy climb. So dont judge Automatic hub is practical good. once the speed is over. I should buy even euro300,00. We wait for you back.